Globally, both national and local governments are struggling to fight corruption; improve the efficiency, transparency, and security of their systems; and to develop a more participative, interactive and democratic citizenship. However, until today neither any organizational model nor technology has been able to solve these needs. Blockchain though is a technology that seems to offer solutions for the improvement of all these issues. On the one hand, this can be achieved through the use of the most essential feature of Blockchain, which is as a registry of information that guarantees that the data is transparent, immutable and secure. 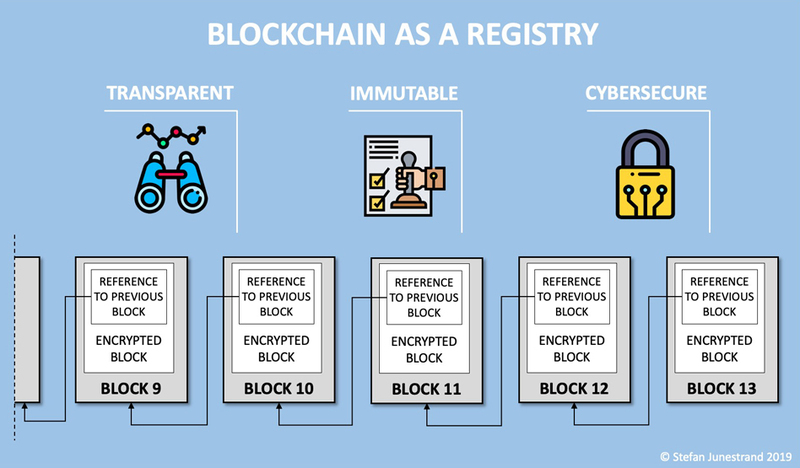 Blockchain used as a Registry offers Transparency, Immutability and Cybersecurity. On the other hand, more disruptive values can be achieved with Blockchain when used as a Token Economy, which is a revolutionary way for the management of public services, providing: an improved control, a faster handling, new tools for the distribution of wealth, as well as data collection for the application of big data and artificial intelligence. This article demonstrates how Blockchain can be used in the governance of nations and cities. Firstly, it gives an introduction to why Blockchain is so revolutionary in this context. After that, there is a short description of what governance is and, following, a more extensive overview and discussion of use cases for the different levels of governance. Blockchain is disruptive and exciting for the governance of nations and cities due to the three main characteristics and the revolutionary economic model that it can provide. Transparency: everybody can see and read the data stored in a public Blockchain. Immutability: nobody can change a previous block in the chain. Cybersecurity: decentralized architecture, combined with the information stored in chains of blocks using complex cryptography, makes it almost impossible to hack. The possibility to build an economy not only based on currency but using tokens that can also represent other values, such as physical assets, services, and rights. The tokens can be given properties for a conditional use to define where, when, how, and during which circumstances they can be used. Smart Contracts that can execute the economy in real time without the interaction of any human. The possibility to easily apply data analytics and artificial intelligence to improve both services and strategies. The Token Economy opens up new possibilities for governments to improve efficiency, wealth distribution, and to enhance desired behaviors in line with the political goals. A Token Economy built on Blockchain open up new ways for efficiency and wealth distribution in Public Services. It is worth to highlight that Blockchain is also especially suitable for environments where there is low trust between the actors. The lack of trust is the case of most relations between the governments and its citizens and hence makes Blockchain very relevant in public services. However, before looking at how Blockchain can be used in governance, a brief introduction to how governance works is presented. Public Governance is the exercise of power or authority conducted by political leaders for the well-being of their citizens or subjects. However, the governments themselves cannot do everything for their people, so governance has become more and more associated with the concept of decentralization of power and the involvement of the private sector and the civil society. Top-Down: Through top-down methods that primarily involve governments and the state bureaucracy. Networks: Through networks involving the public administration with public-private partnerships and the collaboration of community organizations. Regulation: Through the use of market mechanisms whereby market principles of competition serve to allocate resources while operating under government regulation. Governance can be conducted both in a good and a bad way. To identify what good governance is, the following eight indicators can be used: it is participatory, consensus oriented, accountable, transparent, responsive, effective and efficient, equitable and inclusive and follows the rule of law. When looking at these eight indicators, it is clear that all these can be achieved, or at least radically improved, by using Blockchain. 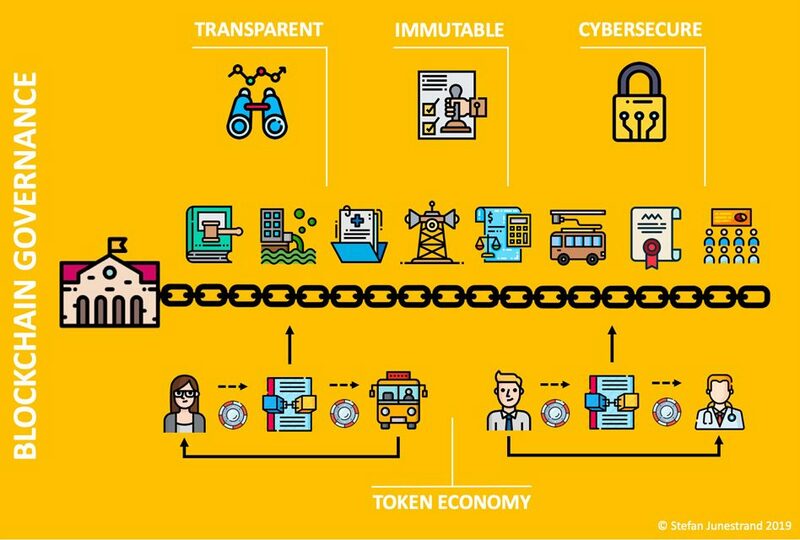 As Blockchain offers transparency, immutability, and cybersecurity; establish trust; and permits new governance models through the Token Economy. Hence Blockchain has caught the attention of many stakeholders. And although Blockchain is by no means the solution to solve every problem within the public administration or the governmental services, it offers exciting solutions to many of them. As seen previously, there are three different ways in which governance can be carried out: through top-down, networks and regulation. Below, it is analyzed how Blockchain can potentially be applied in different use cases to achieve good governance in each one of them. The State Bureaucracy is the first way of governance, where it is carried out in an authoritarian way from the top of the public sector, down to the private and civil society. Succeeding, some of the most relevant Blockchain use cases in relation to this model are presented. Current democratic models are generally based upon elections where the citizens vote, with several years in between, for political parties with political programs and their representatives. This traditional model of governance responds poorly to today’s management of nations and cities which continuously gets more complex and changes in an increasingly faster rate. This malfunctioning of democracy in today’s society is reflected in low participation in elections and the increase of new ways to protest against governmental politics. So, it is rather apparent that there is a need to improve the participation and involvement of the citizens in political processes at all levels. 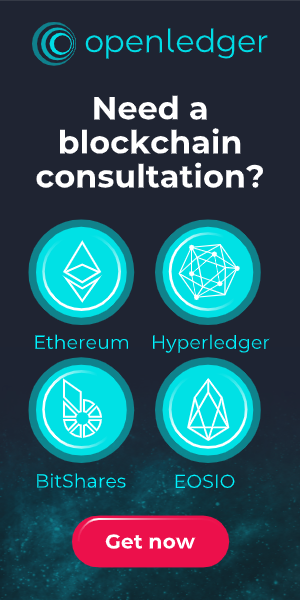 Blockchain can offer new disruptive models for decision making with functionalities such as: the possibility for citizens to engage and participate more directly in areas they are interested in, real-time participation in voting processes, new ways for politicians and experts to build credibility and authority and the possibility to delegate ones votes to authorities within specific areas. Aragon is an example of a Blockchain platform, where organizations can be built online, with alternative models for management and decision making, which highlights interesting alternatives to current democratic models. Correct identification of people, entities, objects or even autonomous agents is crucial for all the actors involved in providing services within the digital economy. Identification is necessary for the individuals use of essential services such as voting, property registration or banking. Moreover, for governments, the identification is necessary for example: to verify citizenship, to tax, or to assign the rights to health services and education. The lack of reliable digital identification is also stopping the development of many interesting and valuable services within governance. Blockchain Digital Identity project ID2020 Alliance (source). Blockchain can provide solutions for decentralized identities that can identify us without the use of a third-party authority and even without revealing more information than necessary for the specific interaction in the moment of identification. The Digital Identity is a use case for Blockchain in government services, as well as a key for the integration and functionality for many other Blockchain services. 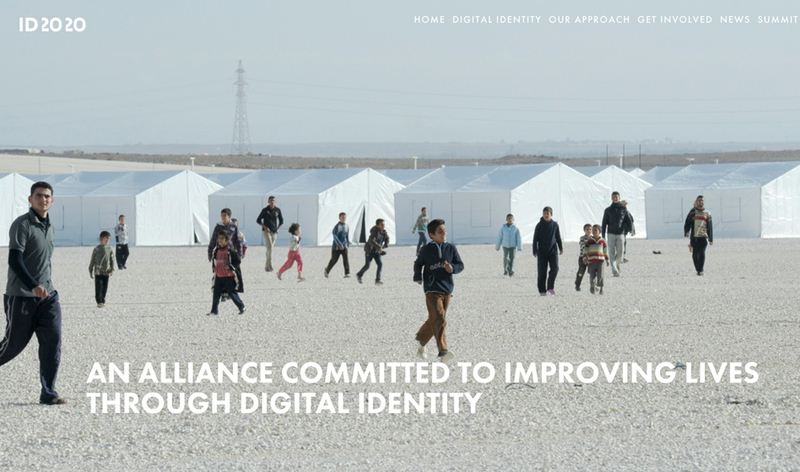 The ID2020 Alliance is a public-private ID partnership for digital ID. The city of Zug in Switzerland has issued the first publicly verified Blockchain-based ID, and in Finland, the government has introduced a Blockchain-based identity system for refugees. The voting participation in elections is continuously decreasing due both to disillusionment, indifference, or a sense of futility, as well as the fact that voters still have to attend a polling place to cast their ballots. If citizens could vote from smartphones or personal computers comfortably and securely, more participatory democracies could for sure be achieved. With Blockchain it is possible to design e-voting systems that are much more secure, transparent and trustworthy, and still capable of preserving confidentiality. In current use cases, the city of Zug has used their Blockchain IDs to conduct their first Blockchain-enabled e-vote. Voting with Blockchain has also been done in places like West Virginia in the U.S. and Moscow, Russia. Public accounting, finances, contracts, and other information is still inaccessible for citizens or companies in most countries of the world. This lack of transparency is an essential reason why corruption and manipulation are easy to carry out. Blockchain can bring total transparency and immutability to the public administration. In accounting, all the incomes and payments can be scanned and registered on a Blockchain for full accessibility to show for what, by whom, and when every single cent has been spent. Smart Contracts can solve taxation in real-time and also show who has and has not paid their taxes. The full information about any public contract, with the conditions, deliverables, and payments can also be shownand followed up in real time. Estonia has a big part of its public administration on Blockchain. And many other countries and cities are starting to implement Blockchain, and for example, the public administration of Dubai will be digitalized, and paper-free by 2021. The number of registers and record keeping within the law enforcement and the legal systems is enormous, and in many cases, it suffers from lack of transparency, the access to information is slow, and it is under suspicion for manipulation. The registration of data for police records and legal cases on Blockchain would add trust to the legal systems thanks to transparency and immutability. Many Blockchain projects for law enforcement and judicial systems have been proposed globally, such as the tracking of the use of police firearms and the registration of police video surveillance to make sure data is both registered and not manipulated. The registration of titles and assets is usually done in centralized systems controlled by different levels of governments which is a very vulnerable solution. In the case of natural disasters, war or cyber attacks, centralized registers can disappear. Moreover, with totalitarian governments, land and other properties can be stolen through changes in the centralized records. The Swedish National Land Registry runs a Blockchain project since 2016 (source). To avoid the loss or manipulation of public registers, Blockchain has been proposed for the registration of land and other properties. 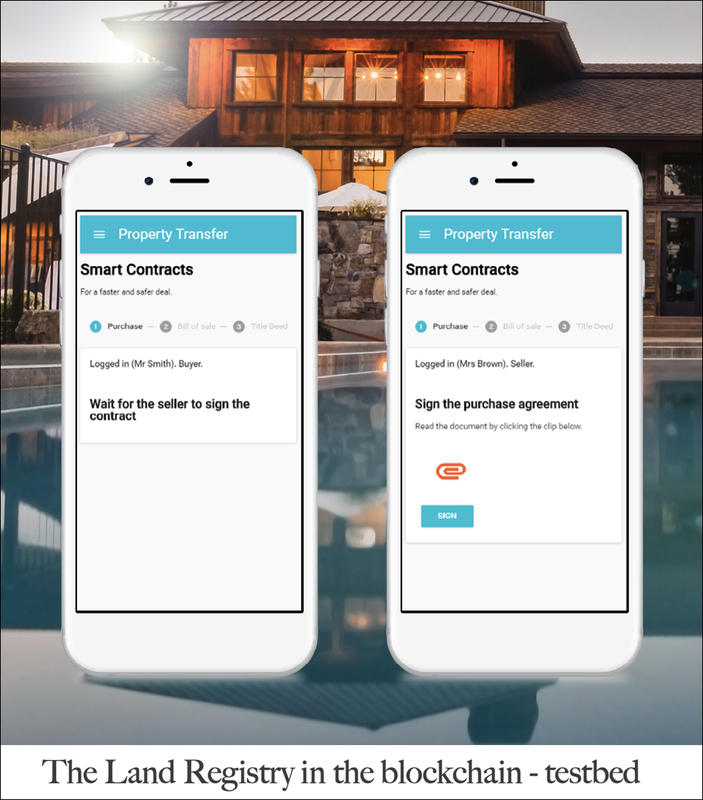 Moreover, with the use of Smart Contracts, the changes in ownership could also be done in real time. The Swedish public land registry has a project using Blockchain for land registration, and many other countries are doing the same. Other areas where Blockchain has been applied for registration are for example car registers in Denmark or the filing of companies and firearms. The access to trustworthy sources to verify that an individual or organization has the certification they claim is slow and lacks transparency in most countries. This is the case in educational certifications where information is frequently kept in databases at the schools or universities that issued the certificate. 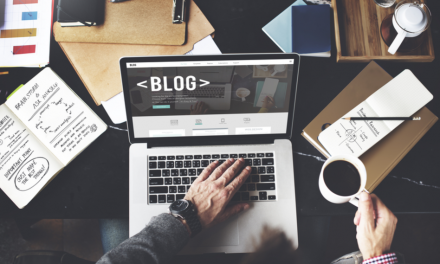 Also, professional and operational certifications can be hard to retrieve. Blockchain systems can give real-time access to certifications regarding both individuals and organizations. At the same time Blockchain can let the individual, or organization, be the owner of their data, but with the guarantee that the information is real and up to date. The potential here is vast, and the importance of these solutions has been widely recognized. An example is Malta that soon will start to issue Blockchain certificates for professional and informal education. An essential part of possible governance services using Blockchain solutions with Smart Contracts includes monetary transactions, and since digital versions of the national currencies are not available, it is currently necessary to use cryptocurrencies as a proxy, which is both costly and insecure. Digitalizing national currencies with Blockchain could make them an integral part of the Token Economy, which would increase resiliency, security, efficiency, and transparency, while, if desired, preserving privacy. Governments could potentially use Blockchain-based tokens in non-monetary ways as well, distributing tokens that can be exchanged for different government services, creating more dynamic Token Economies. Various central banks, such as Lithuania, Singapore, South Africa, Russia, the UK, and Sweden, have been looking at tokenizing national currencies to create fiat cryptocurrencies. Cryptocurrencies and Token Economies are critical enablers for the Governmental Network services that we will look further into in the following chapter. As explained above, a second way to carry out public services in governance is through networks involving public-private partnerships with the collaboration of community organizations. Below are some examples of how Blockchain can be used in networks for public services. Healthcare is one of the biggest and most expensive areas of public services. Moreover, public spending on health is continuously increasing, both due to the eldering population and the increase in health problems caused by the change in lifestyle. Hence, it is necessary to find new ways to manage public health services, so that an improvement in health can be achieved and costs can be controlled. The Blockchain project Solve Care offers an ecosystem for integrated healthcare (source). The Blockchain offers an exciting new way to manage public health services built upon a Token Economy, which would provide: a more efficient and transparent system; a tool to incentive desired behaviors; and the possibility to easily apply data analytics and artificial intelligence to improve both services and health care strategies. 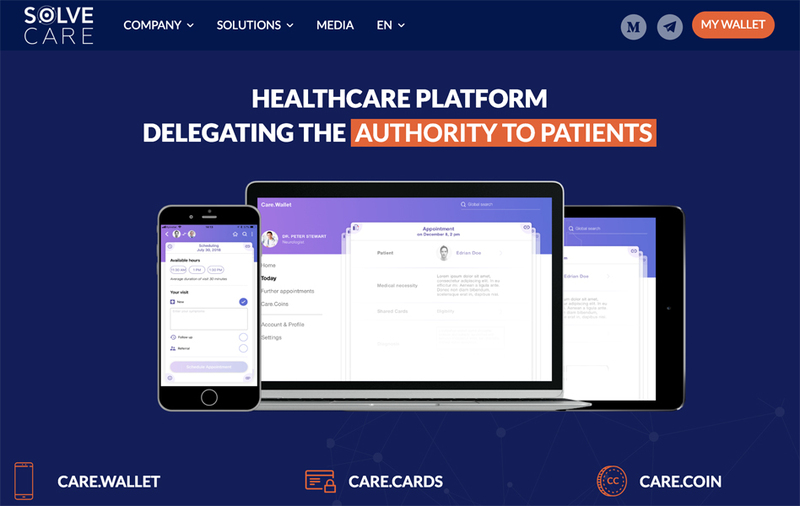 Several Token Economy based health care platform have been developed and some specific areas have very advanced solutions, specially the management of health records or the control of the supply chain for medicine. Although technological and pedagogical solutions exist for an individually adapted education, schools and universities are still essentially offering mass education with very low flexibility and adaptation to individual needs and capacities. This educational model is both expensive and gives poor results but exists due to the established structure of the system and the weak incentives for change. Blockchain could help in several ways in the achievement of a considerably better educational system with more flexibility, transparency, and adaptation to individual needs. The whole educational journey could be developed based upon individual needs and capacities, with the registration of study plans, results, grades and certificates on the Blockchain. The data would at the same time be owned and controlled by the students themselves. A Token Economy could additionally distribute tokens to the citizens to access lifelong education, both to incentivize specific learning, as well as to fulfill anybody’s desire to learn. Models and benefits for social care vary a lot in different governmental systems. However, common factors to all of them are that the evaluation of individual needs as well as the distribution of benefits, always consume a large number of human resources and they are also to some extent arbitrary. Blockchain can be useful in the evaluation system for benefit distribution, by using Smart Contracts, which would provide fairer, faster, more efficient and more transparent handling. A Token Economy can also be used for the distribution of tokens for the payment of different services and products. These can, on the one hand, be conditional on incentivizing or controlling a specific behavior and, on the other hand, they can benefit the receiver as they would be able to pay services and products with tokens, without the seller or provider knowing that the social welfare system is funding it. Several governments, and among them Australia, are currently looking into how to use Blockchain for welfare payments. Mobility and transportation are critical services for the efficiency and productivity of cities, as well as for the quality of life of the citizens. Many governments use advanced systems to control both traffic as well as public transportation, but they are generally closed systems with low levels of both transparency and possibilities of integration. Blockchain offers many interesting solutions to improve transport and mobility. Blockchain would, for example, be an excellent payment platform, for services such as tolls, parking, emissions or transportation, for both vehicles and users. Another huge benefit would be the collection, sharing, and analysis of relevant data to improve mobility. Sustainability and habitability are two of the main challenges for the future of humanity, and our governments are key players in achieving the global sustainable development goals. Non-renewable energy consumption, damaging emissions, the endless waste generation have to come to an end, and biodiversity has to be taken into account. The dominant strategy for reducing environmental and economic impacts is the circular economy, which aims to reduce both the entry of new materials and the production of waste. Actions have to be taken both on a global and local scale, and Blockchain can offer a high added value. Blockchain is, for example, a perfect platform for supporting the circular economy thanks to its ability to track material within their lifecycle or specific supply chains, where it is currently applied in many cases. Also, in applications such as pollution, air, and water quality registration, Blockchain can be used to guarantee transparent and immutable data. The third way to carry out public services in governance is through regulation, which is a market mechanism used in all levels of governance to ensure that quality services are provided while maintaining efficiency and competitiveness. Below a presentation of how Blockchain can be used in some of the most essential regulated markets. The energy markets all around the world are evolving from a traditional value chain of production-transportation-distribution-consumption towards Smart Grids. The Smart Grids are interconnected energy networks with embedded intelligence that permit distributed generation, energy storage, and responsible consumption. Blockchain is being applied both in traditional business models and in new disruptive models that are emerging within the energy sector. Blockchain is for example used for wholesale trading, optimizing of the grid management and for distributed energy networks. These new models have the potential to cut costs, while increasing energy efficiency, support renewable energy integration, improve resilience and enable genuine local markets for energy trading, with optimal supply-demand balancing. 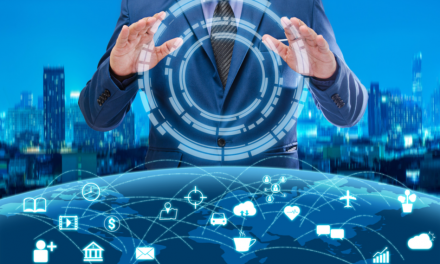 The telecom industry is developing towards hyperconnectivity, were both the number of objects connected to the internet with IoT (Internet of Things) and high-speed connections with 5G are increasing dramatically. 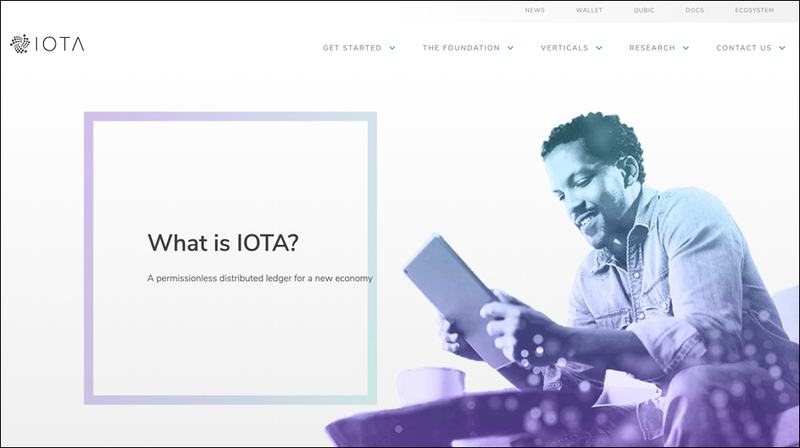 IOTA is a Blockchain solution for IoT devices (source). Many regulated aspects such as intercarrier automation, mobile roaming settlement, identity, and mobile payments could benefit from the speed and transparency of the Blockchain. Specific Blockchain solutions for IoT also offers exciting opportunities, such as IOTA that has the Blockchain functionality built into the IoT devices which offers both faster and cheaper applications. The highly regulated financial sector provides vital services in our society such as guarding, lending and transferring money. However, traditional banking is a centralized model with services that are both costly and slow. Due to the enormous amount of money that runs within the financial sector, it is logical that this is where Blockchain was born with the cryptocurrency Bitcoin, but it is also understandable that the economic issues have continued to be the motor behind many of the developments of the most crucial Blockchain products and services in society today. The cryptocurrencies enable the transfer of money in real time without any intermediaries, ICO models facilitate the initial financing of business without the intervention of any bank, and token economies enable the building of entirely new economic ecosystems outside the traditional financial markets. A problem though has been that many of these solutions find themselves outside the current legislation, which has created legal issues and, in some cases, has led to the prohibition of its use. 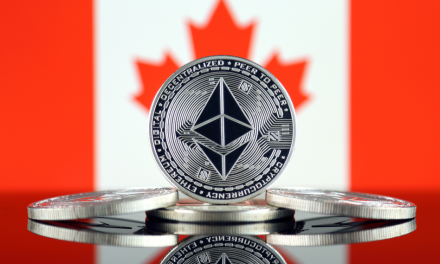 Hence, many governments are now establishing more explicit rules and regulations around Blockchain solutions from both a financial and legal perspective. As seen in this article, when Blockchain is used in government as a data registry it can offer countless opportunities in the areas of transparency, immutability, and security. These solutions are rather easy to achieve from a technological perspective, so its implementation depends mainly on the willingness of politicians and the public administration. 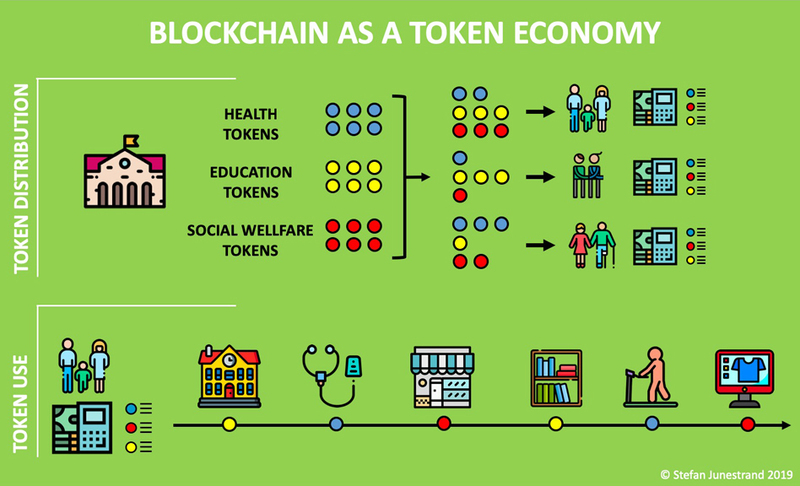 Additionally, the article has presented how Blockchain can be used to create a new Token Economy that can distribute wealth and provide services in aresas such as health, education, and social welfare, in a more efficient, transparent and fairer way than existing models. And even if the Token Economy is challenging to build, it is necessary to develop this kind of innovative solutions in the public administrations if we want to maintain a society that is inclusive, just and attractive for all its citizens. However, to achieve this transformation, it is critical to inform and educate politicians and professionals within the public administration. Because everybody who gets involved or affected by this disruptive solution needs to have a basic knowledge of what Blockchain technology is and how it fits in within the different governmental services. This responsibility to educate and inform lies on all the actors within the Blockchain space. Hence everybody has to collaborate in this journey towards a new and more transparent, secure and efficient public administration. 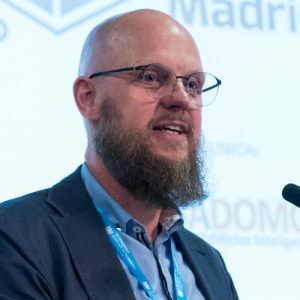 Stefan Junestrand holds a Ph.D. in Architecture and is a Futurist and Speaker about Smart Cities, Intelligent Buildings, Sustainability and Blockchain. He is the CEO and co-founder of Spain's leading Media Company about Sustainability, Energy and New Technologies for the Built Environment. He has written a dozen books and scientific papers and is a Member of the “EU Blockchain Observatory” and the main contributor to the “Blockchain4Cities” report by the United Nations/ITU.